According to the official story, man first landed on the moon 38 years ago today. What makes this special is that 38 years is divisible by 19. And 19 is the period of the Metonic cycle, the approximate common multiple of the tropical year and synodic month. What this really means to us is that the phase of the moon today is very close (within about 6 hours) to what people saw 38 years ago on July 20, 1969. Very cool. This entry was posted in Astro on July 20, 2007 by Darren. Last Wednesday I shot the moon. Because of my knowledge of the Lunar cycle and the recent full moon, I was expecting the moon to rise a few hours after sunset. So I left my room at the appointed time and made my way to the main building on campus. I took the elevator to the 10th floor, climbed the stairs past the elevator room at the top, and emerged on the roof of the building. And there she was, a beautiful orange moon, 18 and a half days old, just rising over the buildings in the distance. 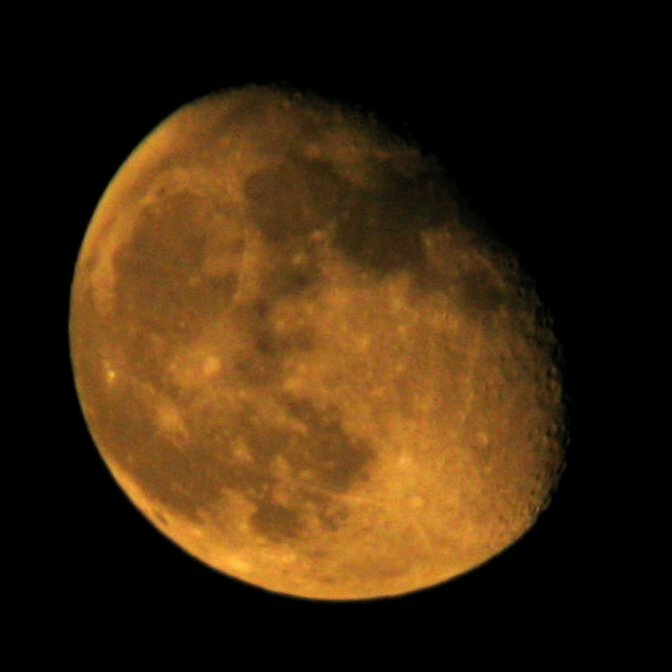 It was a very clear night, but the pollution in Beijing still turned the moon orange. This shot was made with my Canon PowerShot A70 digital camera (a highly configurable point-and-shoot), at full zoom (3x), hand-held, and pressed against the eyepiece of my tripod-mounted 10×24 travel binoculars. I’m impressed with the results, but it took me about 40 shots before I started to get sharp and in-focus images. This entry was posted in Astro on September 25, 2005 by Darren. ctrip. com — A very comprehensive site on booking hotels and tickets for travelling in China. I’m using this for my upcoming Shanghai trip. slooh.com — A subscription-based online telescope. For $50 US a year, you can have unlimited access to their group missions, plus 15 minutes of solo time, where you get to direct the telescope to your object of choice. Cool! Article: How to get the best sound out of your PC — A technical prescription on how to optimize your Windows audio chain. For audio geeks only. madphilosopher del.icio.us bookmarks — An online bookmark storage and sharing service. This link is my account, but you can get one too. The cool thing about shared bookmarks is that you can see how many other people around the world are bookmarking the same sites. And since it’s online, I can access my bookmarks from any machine. Check it out! This entry was posted in Astro, Audio, China, General, Tech on April 19, 2005 by Darren. I just read an interesting Wired article about how Blogger has been experiencing tonnes of glitches and outages lately, really diminishing the blogging experience for its users. I just had to smile, knowing that Mercury is just shaking things up for us again. You see, Mercury is retrograde right now, and Mercury is all about communication, thinking, and technology. So when that planet’s motion reverses in the sky, miscommunications happen, and the communication channels that we rely on—especially technological ones—tend to break. This doesn’t happen because Mercury is somehow punishing us, but it is intended to remind us from time to time how reliant we are on our technology. It is good for the soul to be “off the grid” for a while. I have talked to numerous people in the last few weeks about miscommunications that have happened to them, and I relate them all back to this. I was tipped off to Mercury’s action when my webserver went completely off the wall. This forced me to find a new hosting solution, and alas, to move away from Blogger. As a result, I discovered a new technology called WordPress that I am quite happy with. It’s really a joy to manage and create blog entries under WordPress, and it’s responsive and reliable. Much more so than Blogger. As for Mercury, we have about four more days to go before the planet goes direct again. Take the time to reflect on the gift of communication, in its many forms from natural speech and body language, to the technologically-enhanced forms we use today. And call your Mother! This entry was posted in Astro, WordPress on April 8, 2005 by Darren. Hey, my website is back up. I hope I didn’t lose anybody in the outage. Bruce didn’t give me any explanation, but the IP address did change and the machine failed to notify me. Oh, and Happy Winter Solstice everybody! I just spent the day with Eydie at the Forbidden City here in Beijing. I learned that the Winter Solstice is one of the special ceremony days for the Emperor in Old China. So it was a great day to go. We wore many layers of clothes cause it was a cold day, but we stayed mostly warm. Eydie is at home now warming up her toes. This entry was posted in Astro, China, Tech on December 21, 2004 by Darren.